The number of renters in their early 60s jumped 84% between 2006 and 2016, and with more seniors living longer lives, this means developers have upped their games for amenities in senior living communities. The active-adult apartment complex, Larkspur at Twin Creeks, is in a master-planned community. ALLEN, TX—There are approximately 47 million senior citizens in the United States and that number is expected to double by 2060. With the rapid increase of seniors comes the increase of renters. In fact, the number of renters in their early 60s jumped 84% between 2006 and 2016. With more seniors living longer and staying active, expectations for amenities have resulted in developers upping their games in senior living communities. For example, Larkspur at Twin Creeks, an active adult senior living community recently completed by KWA Construction, offers private wine lockers and a private putting green near dining, shopping and outdoor activities. The 243-unit active-adult apartment complex is located in the master-planned community of Twin Creeks. 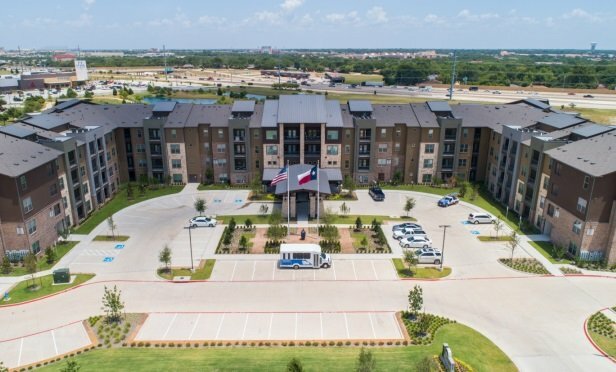 The independent living facility occupies 8 acres and offers 18,000 square-feet of amenity space, including a fitness and mind-body center, woodshop and crafts studio, game room and a complimentary shuttle service to and from the Dallas metroplex. Additionally, the community features access to nearby walking trails, a heated saltwater pool, cabana lounge with outdoor grilling units, movie theater, Internet coffee bar, hair and nail salon, and private library. Larkspur at Twin Creeks provides units ranging in size from 730-square-foot one-bedrooms to 1,280-square-foot two-bedrooms. Each unit has its own balcony, granite countertops, Energy Star stainless steel appliances, full-size washer and dryer connections, wood-style flooring, walk-in closets and built-in pantries. The development was designed by Architettura of Plano. KWA Construction was selected by California-based Drever Capital Management and Dallas-based The Alder Group to build the 260,000-square-foot four-story building located near McDermott Expressway, a major route through Allen. Located at Junction Drive and Raintree Circle, the active-adult senior living community sits in close proximity to Allen Premium Outlets, a variety of restaurants and many green spaces, such as Allen Station Park, Waterford Park and Dayspring Nature Preserve.